Ghana Foods are among the best you can find in Africa. Ghana is endowed with a lot of natural resources including good land for cultivating food stuffs. Major food stuffs in Ghana include yam, millet, cassava, maize, rice, plantain, beans and sorghume just to mention a few. The Ghanaian combines these food stuffs available to them to prepare delicious food which are high in nutrients. Some of these local Ghana foods have been sampled below. 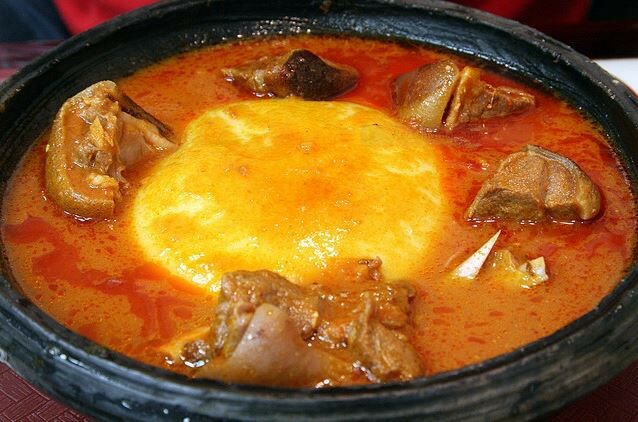 Fufu is one the Ghana foods that is gradually becoming every home’s delicacy in Ghana. It is the main food of the Akan tribe in Ghana. It is made by pounding boiled casava and plantain into a sticky paste and it is best served with tomato light soup prepared with dried fish or fresh meat or chicken. In Northern Ghana, fufu is typically pound with boiled yam. Fufu is usually eaten for lunch or supper. Banku and Tillapia is a delicacy in Ghana. This Ghana food is prepared with fermented corn dough with cassava dough. 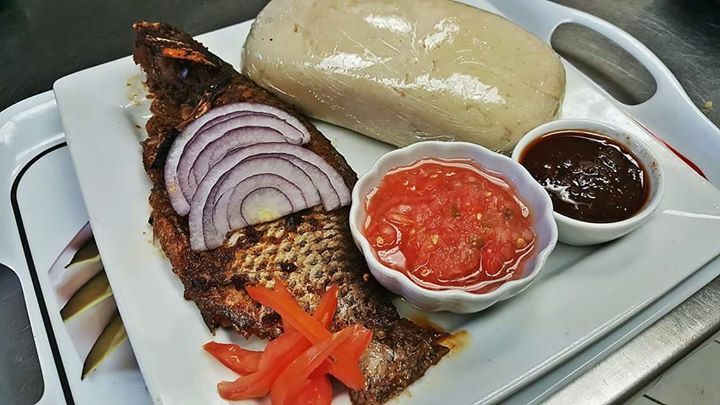 Tilapia is a fresh water fish which is usually spiced and grilled to accopany banku with ground hot pepper. In fact, it is most likely to be tilapia when you see someone grilling fish on the streets of Accra. Banku is a main dish of the people who live along the coast of Ghana including the Ewes and Ga-Adangbe’s. It can be eaten for lunch or supper. Another Ghana food that is made of corn and is full of nutrients is the Tuo Zaafi. This is the main meal of the people of Northern Ghana. This food is dominated by herbs, grain and meat which makes it one of the most nutritious foods in Ghana. Tuo Zaafi is prepared like banku with little or no cassava dough and it is quite soft and less sticky than banku. The accompanying soup is prepared with dawadawa and ayoyo leaves. Tuo Zaafi is usually eaten for lunch. Kenkey is another Ghana food which is corn-based and similar to banku. It is made by moulding fermented corn dough like ball and wrapping it with dry corn leaves and boiling it with water in a pot. It is served with fried fish, usually red fish or Kpanla, and ground hot pepper. 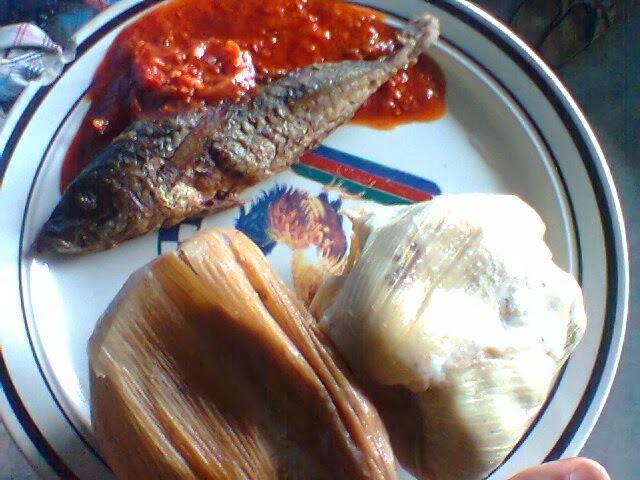 This type of Kenkey is popular among the Ga-Adangbes. There is also the Fante kenkey which is popular among the Fantes. The only difference is that, whiles the Ga kenkey is wrapped with dry corn leaves, the Fante kenkey is wrapped with dry plantain leaves. Waakye is a popular and nutritious Ghana food typically found among the people of Northern Ghana although now-a-days it could be found everywhere in Ghana. It is prepared by boiling rice and beans with red millet leaves which gives it a redish color.It is served with hot pepper stew and garri, spaghetti and sometimes with fried plantain. 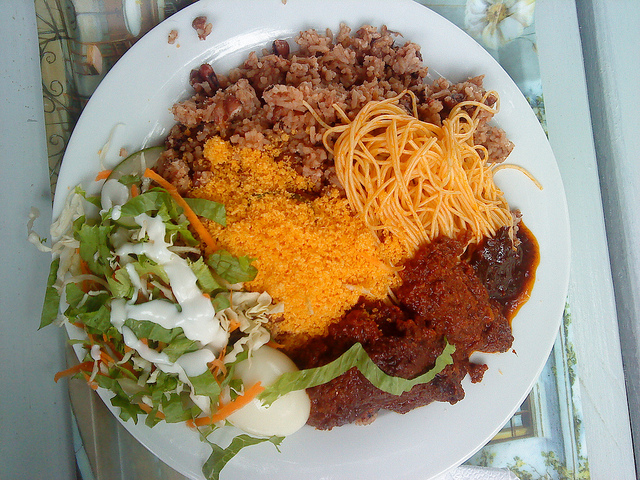 Waakye is popular and it could be found everywhere on the streets of Ghana especially in Accra. Wakye can be eaten for breakfast or lunch. This is another popular Ghana food made with beans and ripe plantain. It is very delicious and good for vegetarians. The preparation is quite easy. 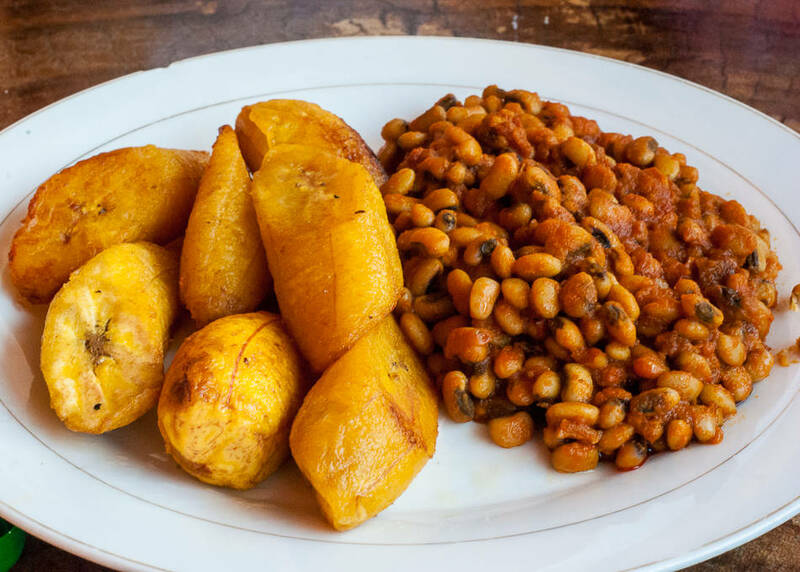 It is prepared by frying ripe plantain and preparing the beans stew with red oil, pepper and beans. It could also be eaten with garri and avocado pear. It could be served for breakfast or lunch. 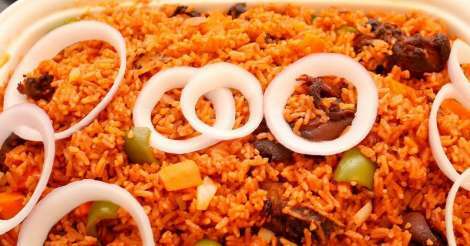 Ghana jollof is one of the most delicious and popular foods in West Africa. There has been an arguemant on which is best, Ghana jollof or Nigeria jollof and Ghana jollof seems to have won the battle. It is prepared with rice, tomatoe stew and meat or fish. It is prepared by mixing the rice with the stew and adding water to boil. When cooked, it could be garnished with salad and egg or fish or meat. It could be served for breakfast, lunch or supper. 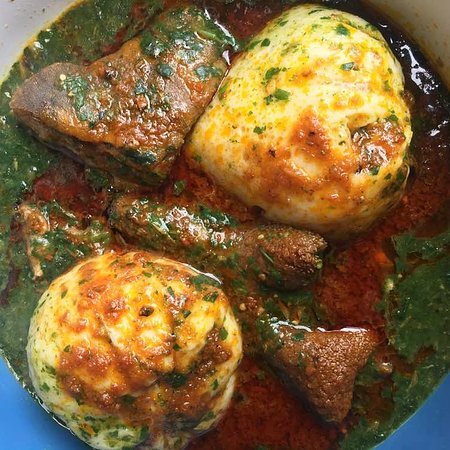 Want to try some of these Ghana Foods? Most restaurants in Ghana have most of these foods included in their menu. Enter any restaurant and ask for one or more of these foods.